Bar count for stepped range fixed. Bar spacing calculated refined with dot mode. Bar spacing is calculated with crossing leg. Fixed error on btn Clear! Bar will automatically flip and rotate when placed in drawing. Error about missing bar removed! User can re-number bars with a leading zeros, AB001-AB009,AB010-AB099,AB100 etc. The collaboration between Addosoft and Bricsys aims to bridge the gap between advanced CAD systems and locally developed solutions, within the South African market. We believe Bricsys provides the ideal combination of a light-weight, yet smart CAD platform, which is extendable in terms of add-on applications. With Bricsys, Addosoft sets out to bring back the local South African ingenuity of specialised design and drafting modules on a very advanced and cost-effective CAD system, without re-inventing the wheel. 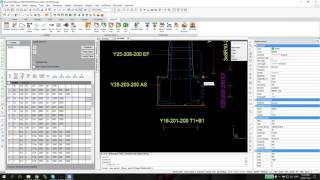 AddoBAR is the next generation platform for rebar detailing software. Our software fuels efficiency within your CAD design process and facilitates both quality and accurate production of reinforcement detailing. AddoBAR works seamlessly with the world's leading CAD software, BricsCAD and Autodesk AutoCAD®. With AddoBAR, detailing is made simple. Inserting, scheduling and changing of bar properties have never been easier. AddoBAR also supports 3D bar display mode, so no need to struggle with alternate means of rendering, constraint solving and clash detection, whilst utilising the powerful object based tools CAD has to offer. AddoBAR is not only a powerful object based, full 3D, detailing solution, it is also affordable, empowering you to create impressive rebar layouts that will land you that important client without breaking the bank. Every user has his own style of detailing. That is why AddoSOFT recognise the power in user customization. By developing your own macro detailing routines, you can enhance your production line while eliminating errors and gaining tremendous speed! Share your screen with us through Chrome remote desktop from where-ever you are, and we will support you hands-on in bringing your creativity to life! Download the C# Base Rebar example, This example contains various tools to add outlines and AddoBar entities. This Example is created for BricsCAD® and AutoCAD® with a simple compile derivative. - C#.NET templates to download for developing custom macros (VB.NET will follow). - Join a community of AddoBAR developers and share your creations on-line. BricsCAD® is the powerful CAD software and development platform unifying the familiar feature set of native dwg with advanced 2D tools and intelligent 3D direct modeling on Windows and Linux. The software allows design, engineering and manufacturing professionals to enter the world of 3D direct modeling without the need to leave their familiar dwg environment, and this at a compelling price. BricsCAD provides application developers with the software platform and broad suite of standard APIs required to deliver advanced solutions to cost conscious customers in the AEC, GIS, civil engineering, process & power, and mechanical CAD markets. Available in more than 15 languages and with hundreds of Third Party solutions, BricsCAD is so much more than an alternative.